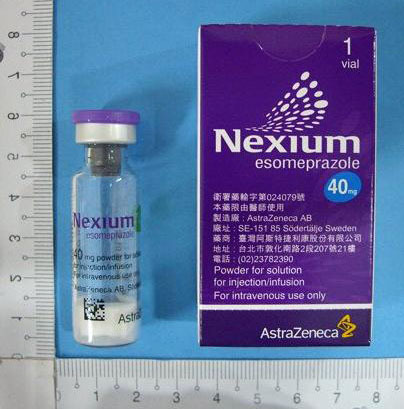 Esomeprazole is a proton pump inhibitor (brand name Nexium, Essocam) which reduces acid secretion through inhibition of the H+ / K+ ATPase in gastric parietal cells. By inhibiting the functioning of this transporter, the drug prevents formation of gastric acid. Esomeprazole is the S-enantiomer of omeprazole (brand name Prilosec/Losec). Generic versions are available in several countries of Europe and in emerging markets such as Pakistan, India, Peru, Ecuador, Caribbean Islands, Nigeria, Africa, Sri Lanka, Cambodia, and Myanmar under the brand name Raciper. In Bangladesh, esomeprazole is sold under the brand name Opton by Beximco Pharma, Neptor by Sandoz Bangladesh. The primary uses of esomeprazole are gastroesophageal reflux disease, treatment and maintenance of erosive esophagitis, treatment of duodenal ulcers caused by H. pylori, prevention of gastric ulcers in those on chronic NSAID therapy, and treatment of gastrointestinal ulcers associated with Crohn's disease. Esomeprazole is combined with the antibiotics clarithromycin and amoxicillin (or metronidazole in penicillin-hypersensitive patients) in the 7-14 day eradication triple therapy for Helicobacter pylori. Infection by H. pylori is the causative factor in the majority of peptic and duodenal ulcers. 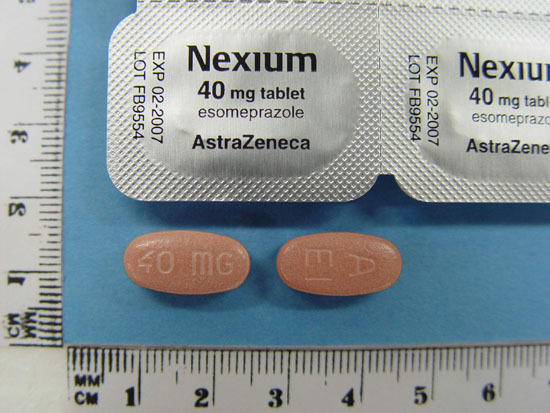 AstraZeneca claims that esomeprazole provides improved efficacy, in terms of stomach acid control, over the R enantiomer of omeprazole. Many noted health professionals, including Dr. Otis Brawley (author of "How We Do Harm: A Doctor Breaks Ranks About Being Sick In America", and currently (as of August 2012) both chief medical officer and executive vice president of the American Cancer Society), have expressed the view that this improvement in efficacy is due to the dose of esomeprazole recommended for therapy rather than any inherent superiority of esomeprazole. In his 2003 address to the American Medical Association, Thomas Sully, then director of the Center for Medicare and Medicaid Services told his audience, "You should be embarrassed if you prescribe Nexium because it increases costs with no medical benefits…. The fact is Nexium is Prilosec …it is the same drug. It is a mirror compound." An alternative rationale suggested for the use of esomeprazole was the reduction in interindividual variability in efficacy. However, the clinical advantage of this hypothesis has not thoroughly been tested in large-scale trials. Given the large difference in cost between all other proton pump inhibitors and that of omeprazole, many physicians recommend a trial of over-the-counter products before beginning more extensive therapies and testing. Although the (S)-isomer is more potent in humans, the (R)-isomer is more potent in the testing of rats, while the enantiomers are equipotent in dogs. Proton pump inhibitors may be associated with a greater risk of hip fractures and Clostridium difficile-associated diarrhea. By suppressing acid-mediated breakdown of proteins, antacid preparations such as esomeprazole lead to an elevated risk of developing food and drug allergies. This happens due to undigested proteins then passing into the gastrointestinal tract where sensitisation occurs. It is unclear whether this risk occurs with only long-term use or with short-term use, as well. Patients are frequently administered the drugs in intensive care as a protective measure against ulcers, but this use is also associated with a 30% increase in occurrence of pneumonia. Esomeprazole is a competitive inhibitor of the enzymes CYP2C19 and CYP2C9, and may therefore interact with drugs that depend on them for metabolism, such as diazepam and warfarin; the concentrations of these drugs may increase if they are used concomitantly with esomeprazole. Conversely, clopidogrel (Plavix) is an inactive prodrug that partially depends on CYP2C19 for conversion to its active form; inhibition of CYP2C19 blocks the activation of clopidogrel, thus reducing its effects. Single 20– to 40-mg oral doses generally give rise to peak plasma esomeprazole concentrations of 0.5-1.0 mg/l within 1–4 hours, but after several days of once-daily administration, these levels may increase by about 50%. A 30-minute intravenous infusion of a similar dose usually produces peak plasma levels on the order of 1–3 mg/l. The drug is rapidly cleared from the body, largely by urinary excretion of pharmacologically inactive metabolites such as 5-hydroxymethylesomeprazole and 5-carboxyesomeprazole. Esomeprazole and its metabolites are analytically indistinguishable from omeprazole and the corresponding omeprazole metabolites unless chiral techniques are employed. Esomeprazole is available as delayed-release capsules in the United States or as delayed-release tablets in Australia, the United Kingdom, and Canada (containing esomeprazole magnesium) in strengths of 20 and 40 mg, and as esomeprazole sodium for intravenous injection/infusion. Oral esomeprazole preparations are enteric-coated, due to the rapid degradation of the drug in the acidic conditions of the stomach. This is achieved by formulating capsules using the multiple-unit pellet system. Esomeprazole capsules are formulated as a "multiple-unit pellet system" (MUPS). Essentially, the capsule consists of extremely small enteric-coated granules (pellets) of the esomeprazole formulation inside an outer shell. When the capsule is immersed in an aqueous solution, as happens when the capsule reaches the stomach, water enters the capsule by osmosis. The contents swell from water absorption, causing the shell to burst, and releasing the enteric-coated granules. For most patients, the multiple-unit pellet system is of no advantage over conventional enteric-coated preparations. Patients for whom the formulation is of benefit include those requiring nasogastric tube feeding and those with difficulty swallowing (dysphagia). The granules are manufactured in a fluid bed system with small sugar spheres as the starting material. The sugar spheres are sequentially spray-coated with a suspension containing esomeprazole, a protective layer to prevent degradation of the drug in manufacturing, an enteric coating, and an outer layer to reduce granule aggregation. The granules are mixed with other inactive excipients and compressed into tablets. Finally, the tablets are film-coated to improve the stability and appearance of the preparation.